Anodizing Benefits for most finish applications SAF – Southern Aluminum Finishing Co, Inc. Most anodized products have an extremely long life span and offer significant economic advantages through maintenance and operating savings. Anodizing is a reacted finish that is integrated with the underlying aluminum for total bonding and unmatched adhesion. Exterior anodic coatings provide good stability to ultraviolet rays, do not chip or peel, and are easily repeatable. Scars and wear from fabrication, handling, installation, frequent surface dirt cleaning and usage are virtually non-existent. 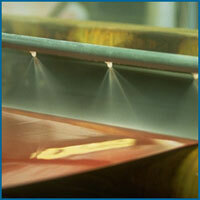 Rinsing or mild soap and water cleaning usually will restore an anodized surface to its original appearance. Mild abrasive cleaners can be used for more difficult deposits. Anodizing offers a large increasing number of gloss and color alternatives and minimizes or eliminates color variations. Unlike other finishes, anodizing allows the aluminum to maintain its metallic appearance. Since the process is a reinforcement of a naturally occurring oxide process, it is non-hazardous and produces no harmful or dangerous by-products. Contact an SAF Pro or visit our SAF ANODIZING FAQS here.